Awesome Family Triple Tail Trip!! Joe, Michael and Bridget were back with me again today for some great triple tail action! Boy did we get ’em!! 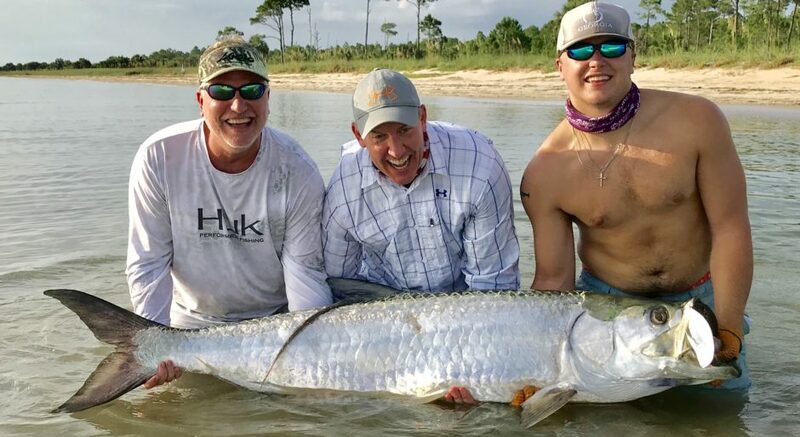 Posted in Fishing Charter Recent Posts	| Tagged Book A Charter, cape san blas, charters, fishing, fishing charter, fishing guide, flounder, gloomis, guide, half hitch tackle, Indian Pass, inshore, inshore slam, port st joe, power pole, Redfish, shallow sport boats, shimano fishing, Speckled Trout	| Comments Off on Awesome Family Triple Tail Trip!! Kids in the Morning having a Blast and Adults in the Afternoon Catching Big Trout!! Posted in Fishing Charter Pictures	| Comments Off on Kids in the Morning having a Blast and Adults in the Afternoon Catching Big Trout!! Too Busy Catching Fish to take Pictures! Posted in Fishing Charter Pictures	| Comments Off on Too Busy Catching Fish to take Pictures! A Good Bite Today for Sandy and Chuck! Lots of trout today, including this 25 incher! Three redfish and a flounder! Great day! Posted in Fishing Charter Pictures	| Comments Off on A Good Bite Today for Sandy and Chuck! Some Fine Trout and Redfish Today!! Both the morning and afternoon groups enjoyed a great bite on redfish and trout today! Posted in Fishing Charter Pictures	| Comments Off on Some Fine Trout and Redfish Today!! Several Species for David and Renae Today! David and Renae caught 6 different species of fish today! They caught 20-25 speckled trout with 12 keepers and 4 of which were over 20 inches! They also caught bluefish, Spanish mackerel, ladyfish, flounder and sharks!! What a day!! Posted in Fishing Charter Pictures	| Comments Off on Several Species for David and Renae Today! Joe, Mary Jane, Pam and Doug showing off some of their fine specks!! Posted in Fishing Charter Pictures	| Comments Off on A Speck-Tacular Day!! Fun Crew from Blountstown, FL! Another fine day on St Joe Bay with very enjoyable clients Meagan, Colby, Bailey and Brett!! We caught 13 keeper trout and several throwbacks! Posted in Fishing Charter Pictures	| Comments Off on Fun Crew from Blountstown, FL! Wow the Huge Trout today!!!!! Unbelievable bite today as my clients caught well over 30 trout and 5 over 23 inches!!!! Not to mention a couple redfish and 5 nice flounder!! Thanks Sonny, Debbie, Jeep and Doug! Posted in Fishing Charter Recent Posts	| Tagged Book A Charter, cape san blas, charters, fishing, fishing charter, fishing guide, flounder, gloomis, guide, half hitch tackle, Indian Pass, inshore, inshore slam, port st joe, power pole, Redfish, shallow sport boats, shimano fishing, Speckled Trout	| Comments Off on Wow the Huge Trout today!!!!! Monster 27 inch speckled trout, redfish and flounder for these boys from Atlanta!! Posted in Fishing Charter Pictures	| Comments Off on Monster Speckled Trout! !